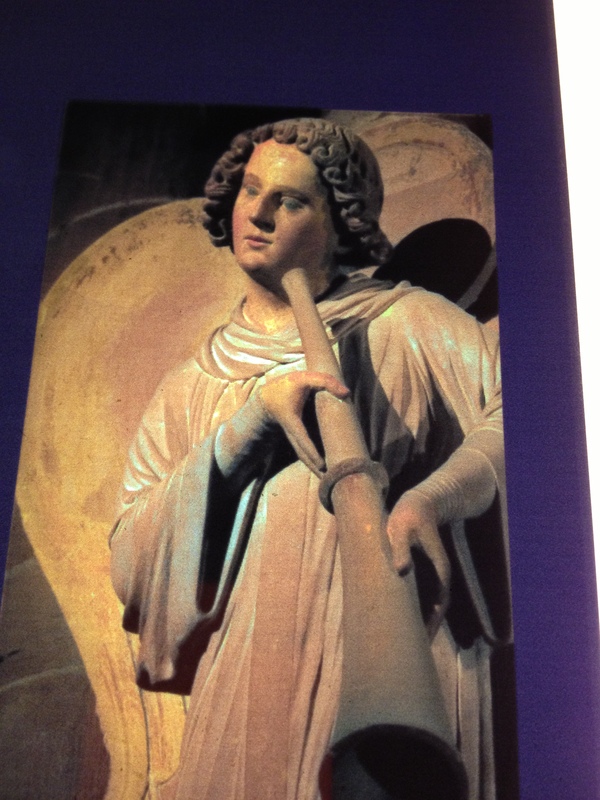 Among the many wonders of Strasbourg Cathedral is the Tower of Angels. The breathtakingly beautiful column reaches from the cathedral floor all the way to the vaulted Gothic ceiling. It was sculpted between 1225 and 1230, early in the 400-year span of time it took to build the cathedral. The subject of the column is really the Last Judgment, but it has a startling twist on the usually-dire subject. The four Evangelists appear on the lowest level, with angels above them, then the dead rising, then finally Christ. My criticism of the column as a teaching tool for the faithful is that it’s hard to see the pinnacle, the figure of Christ, and get the point. But helpful placards provide close-ups and explain, in several languages, what is going on. 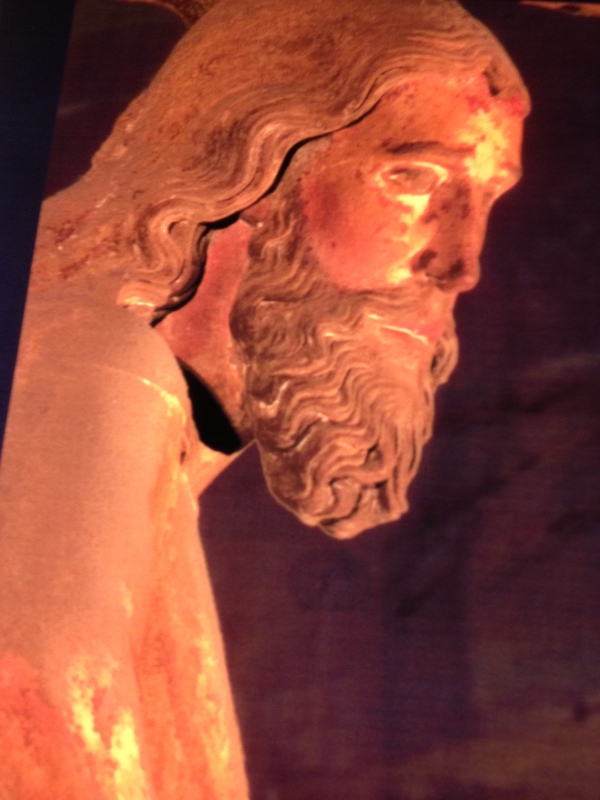 The Christ figure at the top is not sitting in splendor on a grand throne. He is not giving anyone a thumbs-up or thumbs-down. Instead, this Christ bestows a gentle welcoming smile on everyone. This is a humble figure, a figure of loving understanding and compassion for the always-messy human condition. I thought of the tower and its message this morning as I read the bold new statement by Pope Francis concerning the future of the Catholic Church. Full disclosure: I am not now and never have been a Catholic. I visit cathedrals and churches for their art, traditions and history. Wherever I’m living, I attend whatever Protestant church seems the most socially active, inclusive and forward-thinking. But like many non-Catholics, I’m impressed by the current Pope. (Actually, he had me as soon as he decided to wear regular shoes instead of red Papal slippers. Then when he chose to live among regular priests instead of in the much-fancier Papal Apartments, I decided he was worth a listen anytime). In his latest statement, cited in the article below, the Pope said, “I prefer a Church which is bruised, hurting and dirty because it has been out on the streets.” He has consistently shaken things up by insisting that the church should boldly reach out into the world with love, compassion and creativity. His vision is that the church is a place of refuge for all, not a place of harsh judgment. This is not a new idea, of course. But it’s one that can certainly use a new champion. In September, I found the French city of Strasbourg so lovely that I’m planning a side trip there, on my way home from Vienna in December. 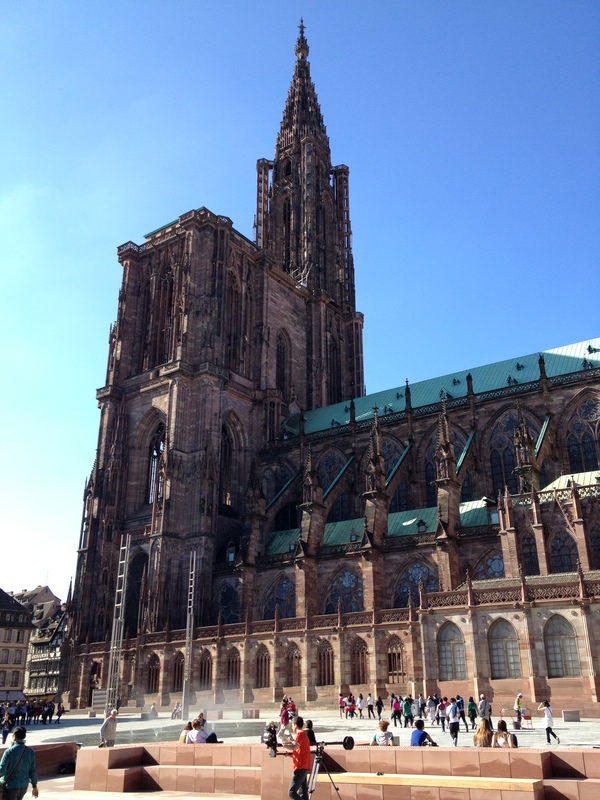 Strasbourg is just two miles across the border between Germany and France. I’ve scheduled a day and a night there. I’ll wander through the Christmas markets, which have been held at the base of the cathedral since medieval times. And I’ll spend time contemplating the season inside this most warm and welcoming of cathedrals. 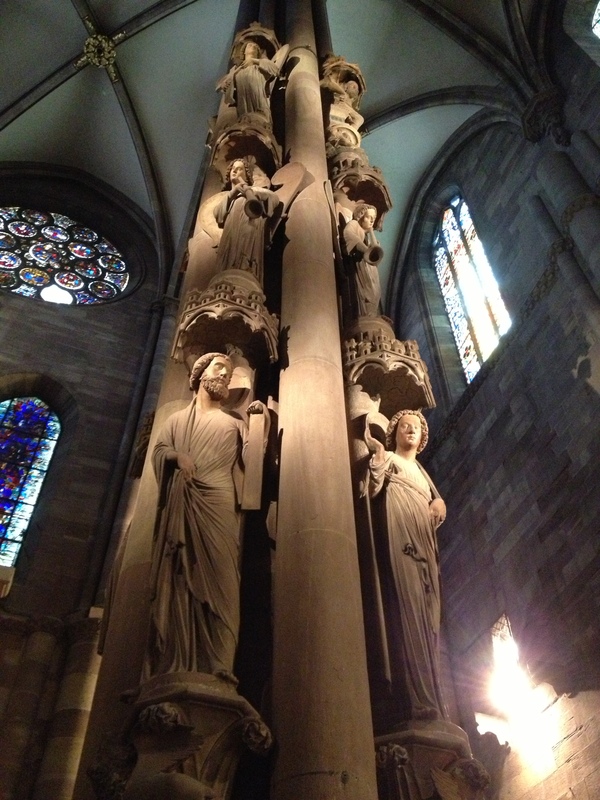 This entry was posted in Art, France, Germany, History, Vienna at Christmas and tagged Pope Francis, Strasbourg Cathedral, Strasbourg Christmas markets, Tower of Angels on November 27, 2013 by Claudia Suzan Carley.